It continues to be the Winter That Wasn’t here in New England. 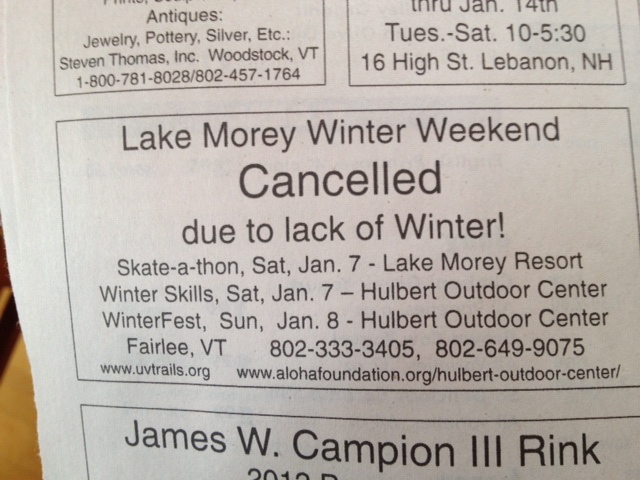 This newspaper notice, sent over from by friends in Vermont, pretty much sums it up. This entry was posted on January 5, 2012 at 2:56 pm and is filed under Uncategorized. You can follow any responses to this entry through the RSS 2.0 feed. You can leave a response, or trackback from your own site. I lalways look forward to snow, but this year am hoping for no precip. My son just bought a great house, except for the efflouressence (sp?) in the basement. Hoping a low water table will cure it, not a french drain…..
Love the ad, thanks for posting! This is my first winter without modern heat. I haven’t even been burning wood at night. I am glad that old man winter is going easy on me. We’ve been having below-average temps this past week in the mid-Atlantic region (highs barely reaching freezing or 32, lows in the teens to 20s), BUT things are supposed to revert back to a bit warmer-than-avg starting tomorrow, which will be a welcome respite to me. I think we’ve been having “your” weather of late! Same here in little ‘old’ England…. it’s been in the 50s all week… whereas this time last year it was 7F!! Very very strange… but great for the heating bill! Yesterday in these parts winter began, as enough snow came down to cross country ski. These parts would be the southern Berkshires of New England. Winter is a special season what with taking in the fresh air and open vistas. The boiler went belly up last week in this little arts & crafts bungalow, and what’s left is the propane oven/range and a kerosene stove. The basement has only gone as low as 38, but a plumber will be brought in for consultation. The is a big bucket for washing up and the stone cold sprayer in the kitchen sink does for hair washing, with a kick that words must still be searched for. Frosty regards for this excellent cold house journal blog. Brrr! Time for a wood stove, man. Hang in there! It’s like an anvil, that kick to the skull.